We offer our clients with high quality Frozen Mix Vegetable that are a blend of different high quality vegetables. These frozen mix vegetables are frozen and packaged in good manufacturing practices and hygienic conditions. We offer these vegetables in superior quality maintaining its nutritional value. 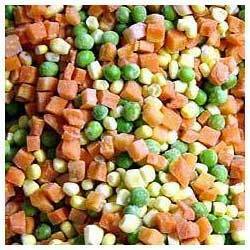 We offer high quality Frozen Mix Vegetableto our esteemed customers. This product is highly demanded by different clients who are associated with food processing industries to prepare various food items. We ensure that no artificial colors and preservatives are added so that there is no harm to the nutritional value of the food. The products are procured from very renowned local cultivators. They are very hygienically packed and transported very safely to the clients.